Those for filling are what we need a lot of and so have begun saving already. For this particular use, we don't carefully blow them out but just cut off one end with a serrated knife. We carve a fairly large hole because the Easter Hare will use these as delivery vehicles for little trinkets. They're dyed just as one would dye any regular hard boiled egg. A treasure is then placed inside and using paint brush, glue and a bit of tissue, the hole is sealed. They can then be hidden on Easter morning to be found by throngs of delighted children. I've had numerous folks request a video of the Paper Star Lantern tutorial since still shots and written instructions are not always clear. This is my first video attempt. It took me thirteen minutes to make the video and three hours to figure out how to get it into the blog. (A sad commentary on my technological savvy.) Let me know if you think it's helpful. And enjoy your lanterns! Before we leave the Valentine season behind, I wanted to share one final heart craft idea. This one is not my own but was a gift to Naiya that her Oma found whilst local artisan shopping last year. Though the front of the pillow is cut from a vintage quilt (that likely was not entirely intact), the back is of a new, soft, plush material. I occasionally find beautiful but somewhat edge worn, hand made quilts in thrift shops and have the instinct to rescue them from their lack of appreciation. What would I do with another old (albeit exquisitely crafted), frayed blanket I wonder? Well, now I know. This one has been well loved. I'm not especially coordinated. I tend to have a somewhat exaggerated fear of being hurt or even uncomfortable while pushing the limits of my body. I'd rather lounge on the patio than bungee jump any day. I can't dance. I have absolutely no interest in extreme sports and hardly an interest in regular sport of any kind. Also, I'm not good at learning things I'm not immediately good at. I didn't learn how to ride a bike until I was ten and was always chosen last for team games in school. I'm not proud of these facts. I'm not especially ashamed of them either. But I have given some thought to normalcy in childhood and the influence my lack of interest and my dis-abilities in this area might be having on my daughter (or might have in years to come). She's not especially amenable to physical risk either. She only climbs the lowest branches of the trees while her friends scale the heights and after struggling two or three times to ride her bike more than ten feet many months ago, she gave up and reacts unkindly to that contraption's infrequent reappearance. That's why when a few weeks back she asked us for a scooter, Ryan and I started immediately searching them out and, after finding one on Cragslist for $10, gave it to her without it even being a special holiday or occasion. She's fallen a few times even though she barely lifts her foot off the ground. Even so, she glows when she rides this thing - laughing and smiling as she putt, putt, putts down the sidewalk. I think she thinks she's doing something absolutely amazing. In my book, she totally is. Maybe she'll be her father's daughter in this after all. Go, my little Razor girl! GO!! "Valentine's Day follows the heart-warming mid-winter festivals of light, and it is said that on this day the birds choose their mates. I've always liked the contrast of the beautiful frozen filigree of snowflakes juxtaposed against the warm, round red image of a heart at this time of year..."
In the end, we ended up not adding anything to our hand made paper. We thought of gluing on additional paper shapes, adding flowers, stickers or ribbons or even a poem but most of the children in Naiya's kindergarten don't read and we liked the simplicity of the heart inlaid in the paper without any bling. Tonight before bed I told the story of the Valentine Sparrow to prepare for the joy of the class exchange in the morning. Additionally, for the past few days I've been telling the story of The Valentine Baker of Pink and his magical heart shaped cakes. This sweet tale is from Juniper Tree Puppetry and Suzanne Down's most recent monthly newsletter (which I enthusiastically encourage all those interested in seasonal story-telling to join). We loved this story as read and also worked it out as a little puppet show. Mostly I was using it as preparation to transition out of "gifting" our daughter for every little holiday. (I do so love to make things but even our hand-mades are getting to be too numerous.) Instead of making her yet another special holiday craft then, tomorrows "gift" will just be a nice spice cake in the shape of a heart that our whole family can enjoy as a Valentine treat together. This morning Naiya picked out her clothes and dressed herself. She's been doing this now and again lately and, I have to say, she has a sense for style that I have never possessed myself. With those naturally wild curls, she looks especially good in hats I think... and also with things just wrapped randomly around her head. Naiya and I have been trying a few ideas out for this year's Valentines. We really liked this concept, but after cutting out all the little hearts for just the two we completed, we didn't think we were up to making twenty more of these. We do know that we'll be working in the paper medium this year though, and although we still haven't formulated the entire design, we decided to make the paper ourselves! Paper making is an old art and, once you have the equipment for it, is pretty easy to do. I've had this pour mold/deckle for years and have no idea where it originally came from but after searching online found something very similar here. One can also make the equipment from fiberglass screens and old picture frames or even from cardboard and duct tape as seen here. Once your equipment is set up, making an actual sheet of paper takes only a few minutes and the possible variations are endless. This is a great craft for kids. What child wouldn't want to make from scratch their own paper, note cards, gift tags, ornaments and Valentines? Naiya loved adding glitter and confetti, flowers, leaves and even wool to create a plethora of one-of-a-kind pages. I've seen people make paper from equipment somewhat different than mine. There is usually a wooden mold with a screen attached and a separate deckle (an empty wooden frame) that sits on top of the mold that serves as the boundary to keep the pulp in place and define the page size. In place of the mold, my kit just has this plastic platform/drain rack and a very fine rigid but flexible plastic screen is strapped between it and the deckle before it is turned over and lowered into the tub to receive the pulp. The tub is filled with warm water enough that the screen sits below it by at least 3/4 of an inch. The easiest way to make pulp is in a blender or food processor using paper, paper towels, newsprint, tissue, shopping bags or even lint from the dryer. One sheet of paper makes one sheet of paper of similar size and thickness so find the appropriate mass and tear the recylables into small bits. Blend the material with 1 -2 cups of water for about 30 seconds to make the pulp. Pour the pulp into the mold and spread it evenly around in the water using gentle fingertips. Carefully lift the deckle from the screen. This may require pushing edges back in place or using a flat edge to help separate the two pieces from each other. Remove any additional interior molds (the cookie cutter in our case). Gently place the piece of screen over the pulpy sheet. With a sponge press firmly down on top of the screen, wringing out the water as necessary, until no more can be extracted. Lift and slowly remove the screen. Place blotter paper (thick absorbent paper, fabric or felt) on top of the pulpy paper and press it with a wood block or rolling pin to extract more water and flatten the page. Flip so the blotter is on the bottom and remove the screen. Place another dry couch sheet (that's the technical paper-making term and is pronounced kootch) on the pulp and blot it again. Repeat this with as many couch sheets as are necessary until no water comes through the blotter. Gently peel away the couch sheets and bask in the beauty of hand made paper. The sheets will take anywhere from a day to three to dry. For instant use try a blow dryer or place the sheet between two thin pieces of fabric and iron on a flat surface until dry. 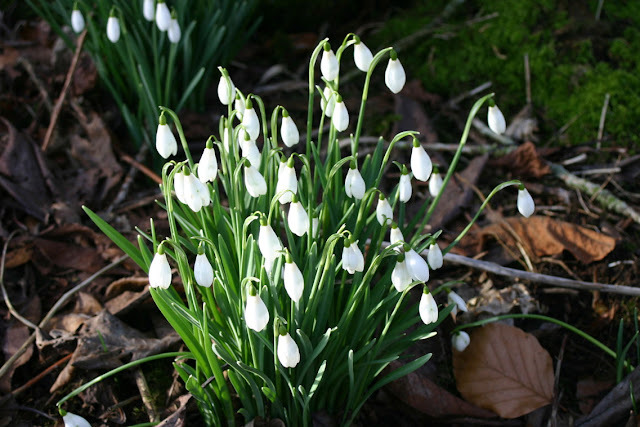 Today we saw our first snowdrops on the way home from school. Mother Earth is already sending forth blossoming bulbs and today we marked this seasonal midpoint by gathering with friends to celebrate the infant light of Spring. We reflected on the fading of darker days kept illuminated by hearth and candle and the much anticipated return of dear Father Sun with his natural, radiant light and warmth. We gathered up candle scraps left over from Autumn and Winter and melted them down to create new votives and tapers for all the celebrations of the year yet to come. A joyous Mid-Winter to you all.